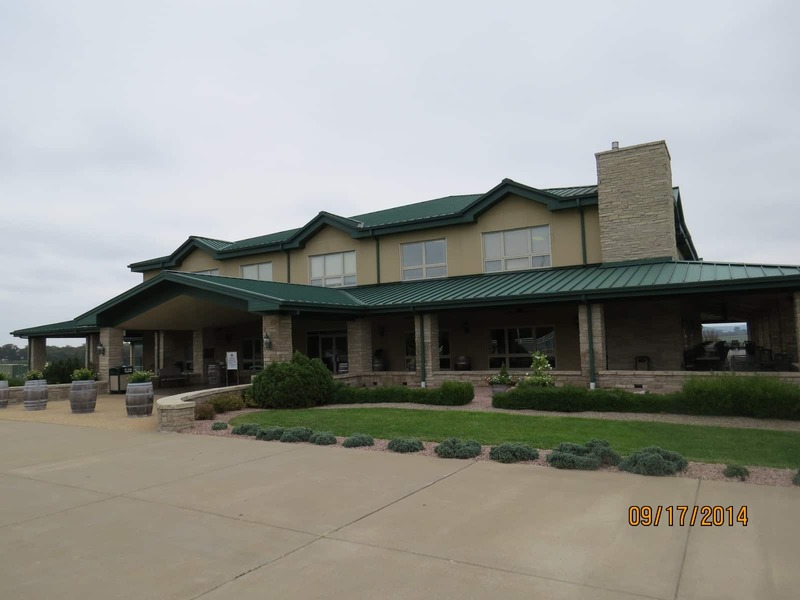 St Louis Restaurant Review visited Crown Valley Winery on September 17, 2014 with the company of Bob Candice, owner/mgr of Candicci’s Restaurant and Bar, Ballwin, MO. Bob accompanied us while in search of quality products for his restaurant. Crown Valley Winery is located at 23589 State Route WW, Ste. Genevieve, MO 63670. You can contact them by calling 866-207-9463 or visit their website at www.crownvalleywinery.com. Crown Valley Winery sets in a beautiful, relaxing area of Missouri resembling the appearance and atmosphere of Napa Valley. I have been to some of the best wineries and vineyards in Napa, Jordon and Carneros Valley. I have to admit that I was a little carried back to different times. When they created this place they did it right. It is tasteful, classy and the setting in one of the most beautiful areas, not just in Missouri, but possibly in the nation. There is too much to say about Crown Valley in one review. Therefore, we will issue a second and maybe even a third review over the next few weeks. We are covering Crown Valley Winery because they have restaurants, but more importantly, they are local and we encourage area restaurants to do business with local suppliers and Crown Valleysupplies several restaurants in the St Louis area as well as offer their products in Schnucks, Dierbergs, Lucky’s Market and Randall’s Wine & Spirits. The founders of Crown Valley Winery are Mr. Joe & Loretta Scott. The facility sets on more than 600 acres and the vineyard occupies approximately 130 acres. They have the largest crop of Norton Grapes, Missouri’s State Grape, in the nation. Mr. and Mrs. Scott created Crown Valley Winery in 2000 and it has been growing successfully from the beginning. The number of products offered by Crown Valley Winery is overwhelming. So hang on, but keep your shopping list near. Additionally, Crown Valley has Crown Valley Brewery and Crown Valley Distillery. Blackberry – our # 1 seller. Norton – This will compare and compete with any CA cab. Crown Valley Winery host and cater to weddings, anniversaries, corporate events, graduation parties, retirement parties and just about anything you can imagine and they do it well. This may sound like a sales pitch but I can assure you that this is an unbiased and independent review. We truly see this as one of Missouri’s best kept secrets. It is a perfect place for St Louis residence to visit because it is a short and beautiful drive that is good for a day, weekend or an entire week. There is a lot to do around the area. Prior to prohibition, Missouri was the second largest wine producing state in the nation and was the largest producer in 1856. Millions of Missouri rootstocks were sent to France in early to mid 19thcentury saving the French wind industry. Crown Valley is close to the St Louis area and supplies many local area restaurants and grocery stores. Crown Valley believes in being green, making and producing items organically without the use of artificial flavorings and harmful fertilizers. St Louis Restaurant Review is dedicated to help improve the public’s awareness of what Missouri has to offer relating to food, wine, beer and cheese. Visit www.missourifoodwine.com. Missouri has International Award Winning Cheese-makers. Visit our review about our cheese makers. Some of the staff members that deserve mention is Brew Master, Jeremy Gilbert, Master Wine Maker, Alywyn J. Dippenaar and Master Distiller, Scott Eckl. We will be writing more about these guys and their contribution to theCrown Valley organization. We could go on and on, but our point is that Missouri has a lot to offer that many of us fail to appreciate due to our lack of information. Missouri’s wine industry is much smaller than it used to be, but with the proper education and increasing the dedication of local area residents; just think, Missouri could be the next California. It’s all about supporting our neighbors. In order to support our local economy give Crown Valley Products a try and if you like them ask your favorite local restaurants to carry Crown Valley Products. It is good for the St Louis area and the entire state of Missouri! SUPPORT MISSOURI! Not only do we want to congratulate Mr. Joe & Loretta Scott, and the entire staff at Crown Valley on their success and a job well done, but more importantly, we also want to express our appreciation for the mark that their efforts, visions and financial commitments have left and will continue to leave on society as well as the local Missouri economy. Crown Valley Winery is here to stay and we recommend that you visit and make their products part of your everyday life. We first published this post on September 22, 2014, revised and republished on February 14, 2015 & May 5, 2015.